A 20-year-old man presented to the emergency department after four days of progressively worsening periumbilical pain. He was moving heavy boxes for his job when he began experiencing pain and was unable to finish his work. He reported pain with defecation but denied fever, chills, nausea, emesis, weight loss, and recent travel or illness. Past surgical history included branchial cleft cyst excision as a child. On abdominal exam, a one square-centimeter erythematous infra-umbilical mass was exquisitely tender to palpation. Laboratory data on admission demonstrated a WBC count of 10.7 × 103 cells/µL and urinalysis was unremarkable. Based on history and physical exam, the patient underwent diagnostic evaluation for suspected incarcerated umbilical hernia. 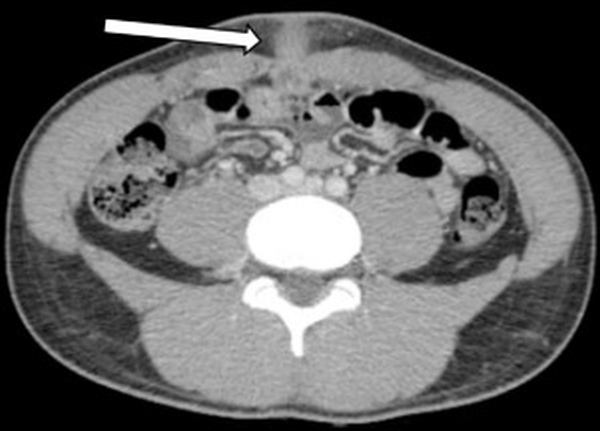 CT abdomen/pelvis revealed a four-centimeter segment of organized periumbilical inflammation with central lucency passing the ventral abdominal wall into the anterior abdominal compartment. The process was extraperitoneal and there was no evidence of communication with the urinary bladder. These findings were consistent with an inflamed urachal remnant complicated by abscess. The patient received intravenous antibiotics in preparation for an operation. 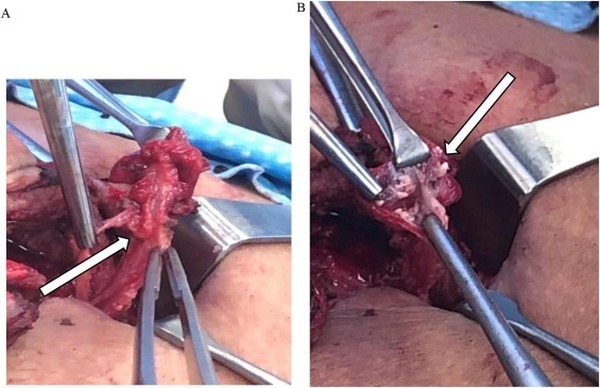 The following day he underwent abscess incision and drainage followed immediately by urachal cyst excision through a four-centimeter infra-umbilical midline mini-laparotomy. 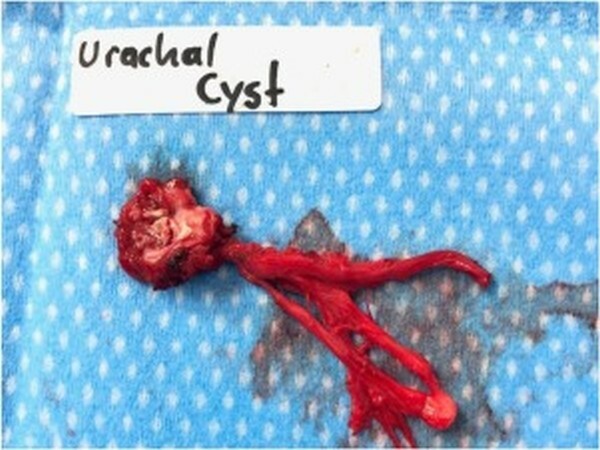 The urachal cyst and remnants were dissected inferiorly to confirm no communication with the urinary bladder before total excision. Investigation of the cyst contents revealed white sebaceous material. Pathology examined the 4 × 3 x 0.7-centimeter segment of fibromembranous tissue and confirmed intraoperative impressions of the specimen. The patient was admitted to the surgical floor where he noted his pain was markedly improved. The next day he was discharged to home on post-operative day two with adequate pain control. Two-week follow up in the outpatient surgery clinic confirmed an uncomplicated recovery.